Just a small problem of forgotten passwords, but I am once again connected. This is the latest quilt I made. It will be a wedding present for university friend of my daughter's. 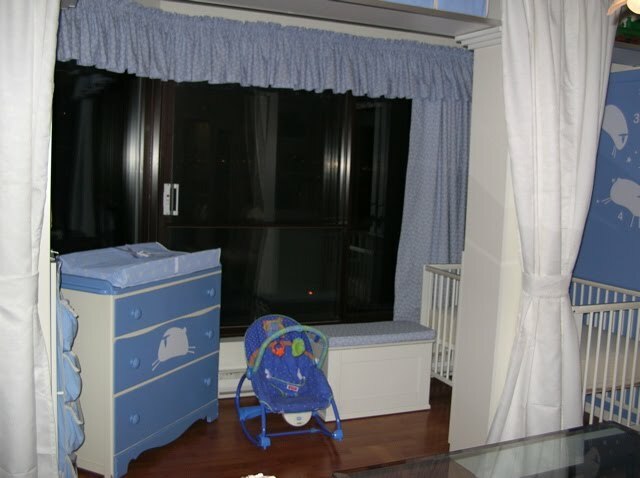 My daughter chose the fabric and I designed a very modern and simple design. I have called it Autumn Meadows as it reminds me of the wild flowers this time of the year. This pot holder was made when I started my beginner quilting class. It was good practise and it went into a basket that our bookclub group made up for Basketeers http://www.basketeers.ca/about.htm. This is a group that provides baskets of goodies to assist abused women in a New Beginnings Program as they leave a women's shelter and start out again on their own. I also made matching placemats in the hope the sunny colours would brighten a meal table. I was intrigued how the design changed when I turned the block 'en point'. With this design I went outside my comfort zone of pairing colours and introduced a green. Again it was all good practise for me. When I used the left-over green/yellow half-square triangles and included them in the border of the Maple Leaf potholder, it was interesting to see how much smaller they became with each 1/4" seam allowance. When I pre-wash my fabric and then iron it, I cut off all the stray thread at the side to make them neater for when I am ready to use them in my quilts. They make such a pretty jumble of colour that I keep them - for what I am not yet sure. Perhaps some textile art one day. Paint Can Challenge - First Prize! Thank you to everyone who visited Quilter's Palette to view all the entries in the Paint Can Challenge. I am amazed to find I won! My husband received the phone call and relayed to news to me at work - all I could keep repeating was 'Wow' and 'I can't believe it'. As a caveat - I have to say that it was winning through viewers choice - I would not have won through quality of work. You can seem from my face how proud and excited I was when I picked up my quilt. The 'challenge' fabric is in each chocolate and in the narrow and outer border. Can you spot the 100% challenge chocolate? Thank you everyone for your encouragement and support. 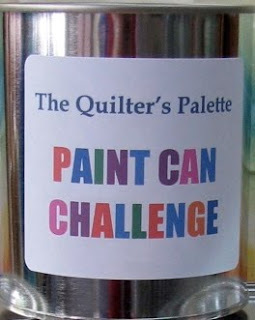 The Quilter's Palette is where I signed up for my first quilting lessons in Sep 2009. 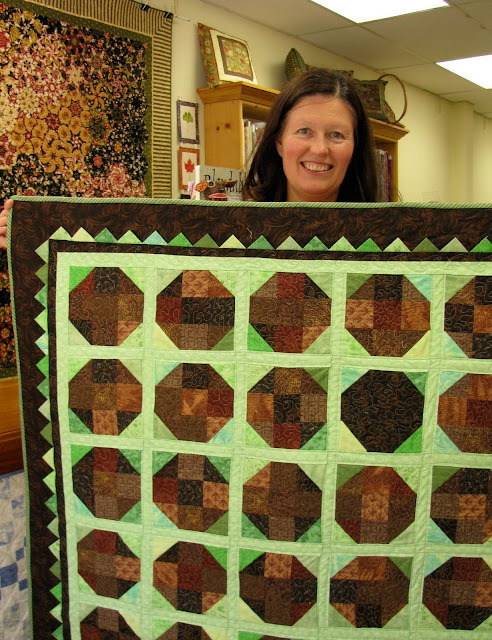 Leslie Edell was my teacher who started me on my journey of learning to quilt. Each week I was excited to learn not only the basics, but to be inspired to make my own creations. The store had a contest call the Paint Can Challenge 2010.
the challenge fabric and guidelines for the competition. The challenge fabric was chocolate swirls - sorry I can't remember the name of the supplier. The finished quilt had to be original and larger than 30x30 inches and smaller than 50x50 inches, and of course feature the challenge fabric in main part of the quilt. I wanted to try the snowball block so I could practise my half-square triangles, and use lots of differrent greens for the mint, and various browns including challenge fabric for the chocolates. It was fun mixing them all up. I used Thangles to create the half-square triangles. Lynn, a fellow novice quilter in my class, had introduced these to me and they really worked! The Prairie Points depict the fancy packaging in a box of chocolates. I enjoyed making these and using the various mint greens from the body of the quilt. As a novice quilter, I gots lots of opportunity to try new techniques in this quilt - and learn from my mistakes! I will let you find them.... However, this is a journey and I am enjoying all the bumps and cross-roads. 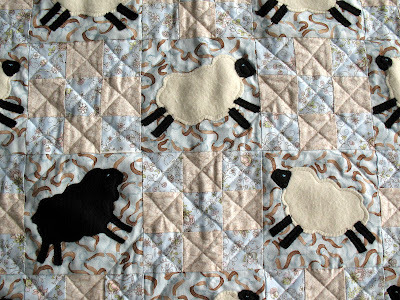 I used the left over fabric to make a bib which also has the sheep motif from the quilt. 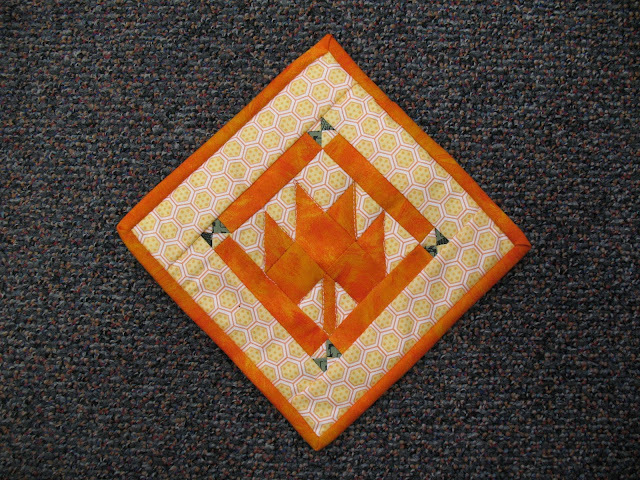 It was a great way to practise outline machine quilting. The bootoes (I just created this word through a typo and will let it stay as they do cover the 'toes'). To create the pattern, I unpicked a store bought, mis-sized and mis-matched pair of cordroy booties. As they were two diferent sizes, I now have new-born and a six month size! They were fun to make and I have subsequently made several others. When my children were babies, I remember that they were always reaching for their toes and socks would go missing. These bootoes always stayed on and were easy to put on and off. This is my first quilt that I made for someone who was expecting their first child. 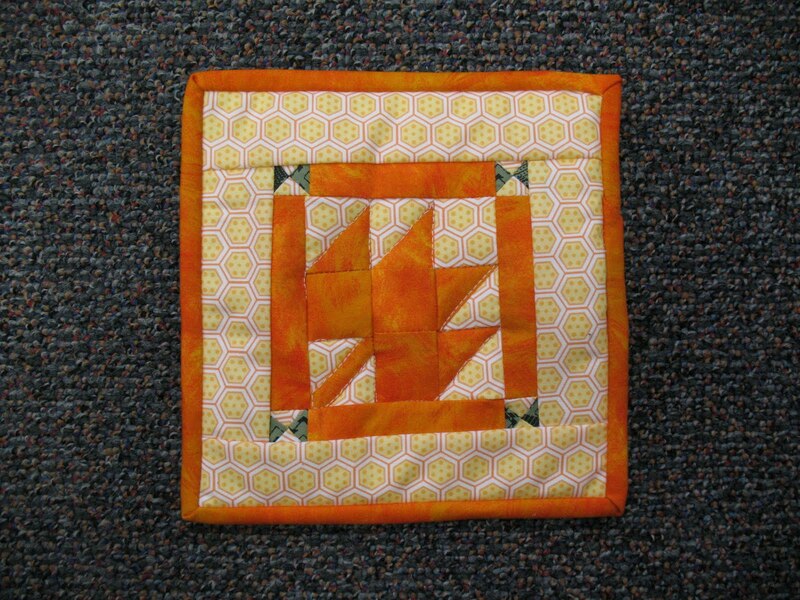 I started a machine quilting class in Sep 2009 and while working in my sampler quilt, I was inspired to make a 'real' quilt. I got the pattern idea while waiting for my husband who was in line to post all our Christmas cards. I was flicking through magazines and saw the design. When I went back to find the magazine, it was gone. Subequent research on the internet makes me think I might have seen a photograph of what a reader had made from a pattern in a prior year issue. The original design may have come from Quiltmaker's issue of Spring All-time favourites 2006. But I have not found either magazine. The sheep are in fleece as I thought young children love to touch and stroke different fabrics. They are machine appliquéd on - as I haven't learned about appliqué techniques and tools yet, this was a learning curve. I couldn't resit adding the black sheep for a more whimsical touch. 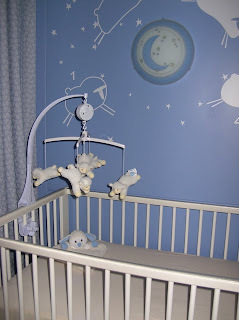 I was going to buy pink and brown fabrics until I found out that a boy was expected! I changed to blue and brown with a soft blue flannel backing. 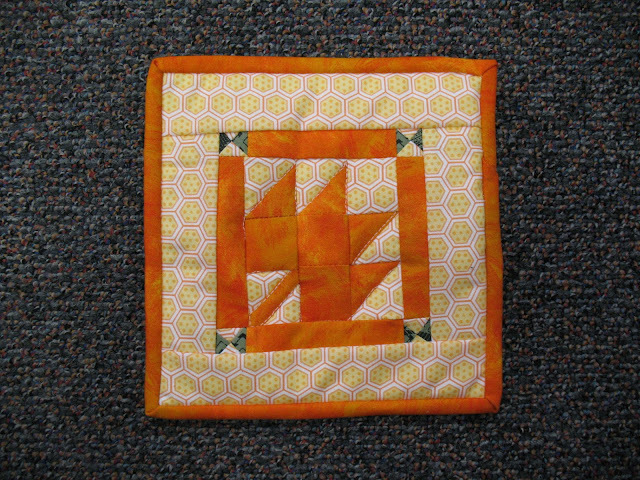 I took a machine quilting class and to my surprise, the teacher had made the same quilt and brought it along as a sample. I had brought my finished quilt top along as I needed to learn how to quilt it. The label uses the same sheep outline. 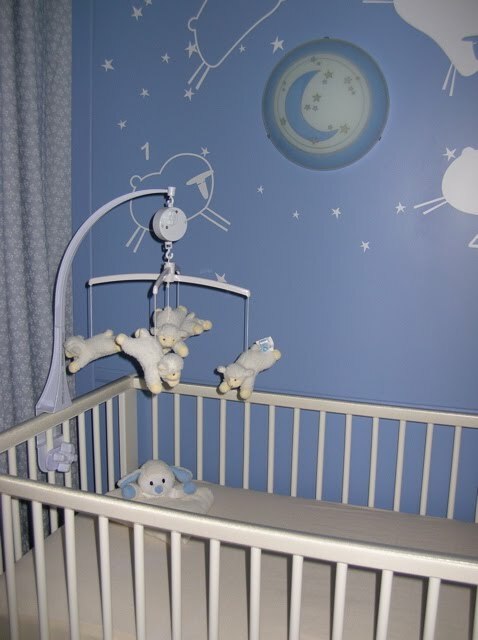 Coincidentally, the new mother had chosen to decorate the new nursery in pale blue with leaping sheep on the walls and furniture too! My daughter created this blog site for me as a birthday present. I will use it to document my quilting journey of learning and friendships. Photo credits go to Mary Rutherford.